Meeting details: Saturday May 18 2013 at 7.00pm. 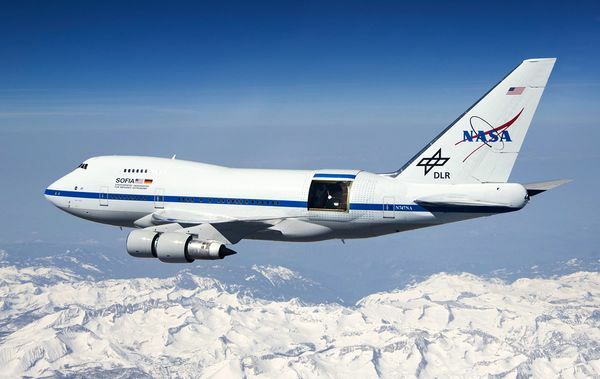 In fact a highly modified 747 owned by NASA. It is well known that the light spectrum we see at the surface is the part which is allowed through by the Earth’s atmosphere. Astronomy is hindered because our protective atmosphere cuts out the vast majority of the electro-magnetic spectrum. If astronomers can get above 10 kms they have access to infra-red spectrum, a height easily achieved for long periods in modern transport aeroplanes. Here’s a diagram from Stony Brook website indicating the small extent of the visible spectrum that reaches the ground.